If you’re coming to Romania and you’re either 1) trying to save a little money and/or 2) wanting to eat incredibly fresh food, you need to listen up. 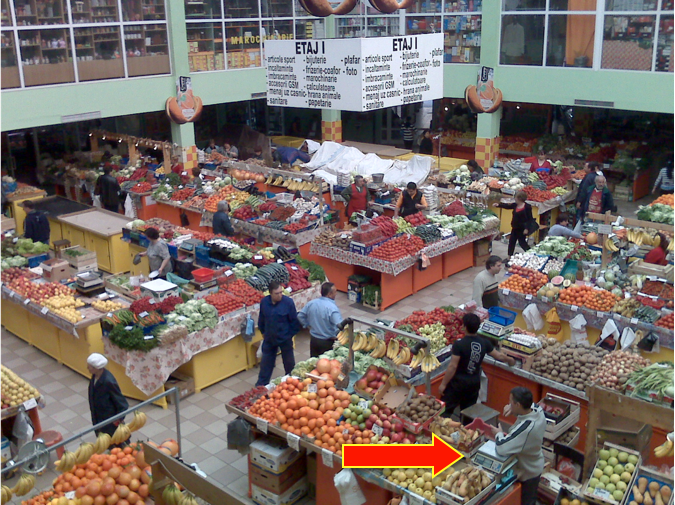 The word in Romanian is piata (pee-ahtza) which just means “market” or “square” or “plaza” or lots of other things. In this case, think of a “farmer’s market” in which fresh meat, dairy, vegetables and fruit are brought in and sold. The correct long form is piata agroalimentara meaning “market of agricultural foodstuffs”. Depending on where you are, you’re going to find one of two different versions in your neck of the woods. The mayor of Cluj went hog wild in the past few years and therefore pretty much all these “markets” in town are of the second variety. In other towns and cities it’s hit or miss. Whether it’s out in the open and trodding over muddy paths or inside a large barn type structure, the piata is going to be a warren of plastic tables with a wide gamut of people behind them, hawking various fruits, vegetables, dairy products and meat. If possible, always go to the BIGGEST piata in the town/city you are in as it usually will be the best as well. Due to refrigeration laws, the meats (and if you love meat, they got it here from snout to tail) are always going to be in a separated area along the sides. Likewise the dairy products are usually sold in separate areas along the side. Usually you can smell the cheese from about 50 meters distance. Other small stores you might see on the sides: eggs, honey, pickled vegetables. At the direct main entrance there should be a little public scale provided by the government for verification of sales. Also scan around and see if you see any publicly accessible wash basins (esp for backpackers on the go). In the center and dominating most of the action is a maze of plastic tables piled high with fruits and vegetables (and honey/bee products). Behind each table is the seller. In front of each product is written the price (in lei). Some sellers have digital scales and some have manual ones. Some kind of bag, carrier, backpack or holdall or something with which to lug all your purchases out with you. You can buy one inside if you like for between 1-5 lei (depending on size and strength). Small bills of cash. This is not the place for credit cards or plastic of any kind. This is a cash wheel and deal situation and you don’t need large bills. It might be very hard to change them so don’t bring anything into play larger than a 50 lei note. It’s also good to have coins to make/pay change with as well. Poftiti (pawf-teets). This is what all the sellers will yell at you as you pass by their goods for sale. It can mean a lot of things depending on the usage but here it means something along the lines of “how may I take your order, sir/madam?”. Un kilogram (oon keelogrom) – Ordering one kilogram (2.2 lbs) of whatever item. O jumatate de kilo (oh jew-mah-tah-tay day keelo) – Ordering one half of a kilogram of something. The first thing to do is take a walk throughout the entire piata or through the sections with the kind of foods you might be interested in buying. Compare the prices with one another. As well, compare which ones look the freshest or the most wholesome or appealing. Also you need just to get a feel for what’s in there and what looks like a good purchase for your needs/financial ability. Let’s say you’ve got your eye on some apples and you’ve done your walk-through and found a couple of semi-appealing stalls, each selling what looks like the same kind of apples for the same price. First, the price you see is per kilogram. Do you want a kilo (2.2 lbs) or just a couple? If you only want a few/little of any item, check and see if the seller has a digital scale. If they do, this operation is a lot easier. 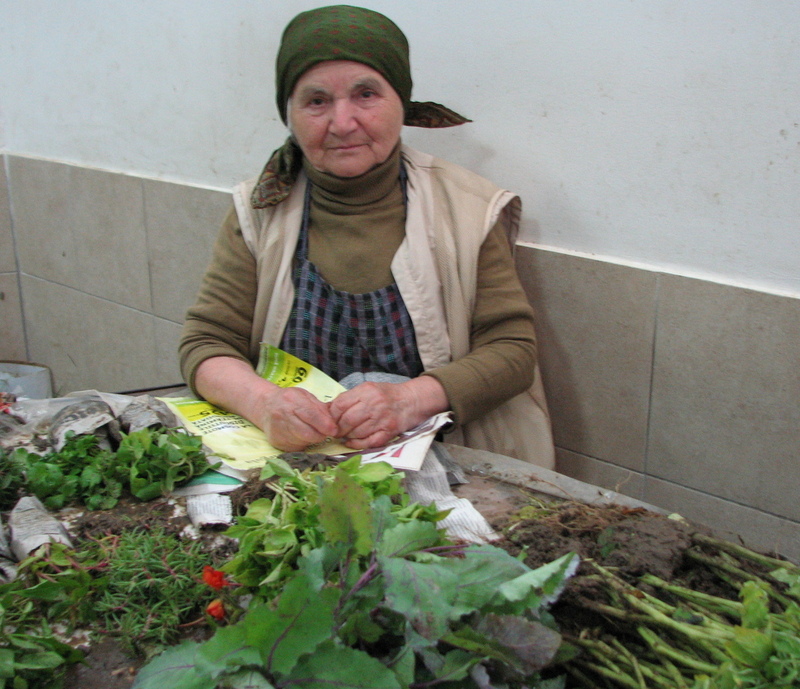 Due to what the nature of the piata is, all of the food being sold there is fresh and in season. There are some obvious imports (bananas, pineapples, etc) but a good part of what’s being sold is fresh local produce. Not only that but because it is essentially being sold at wholesale, the prices are lower than absolutely anywhere else. So you’re paying the least amount of money for the best food. There’s a slight danger of pick-pocketing but not very much. No, the biggest danger will be throngs of crowds hemming you in on all sides. If you get claustrophobic, be on guard! Won't you please buy my vegetables? Despite the fact that you’re the buyer, the sellers are all quite surly and grumpy. You are allowed to eyeball their produce but as soon as you start touching it, you’ll get yelled at. Should you want something, you simply tell the seller what you want (3 apples or 1 kilogram of apples) and she will brutally scoop it up into a bag for you. Often she will try to upsell you to a slightly better deal if you buy a little bit more. It’s always better if you have your own plastic bag because otherwise you might be forced to buy one off the seller. Whenever you’re doing haggling, you put the money and lay it on the fruit/vegetables itself and never hand it to her directly. Unless perhaps it’s a single bill and you make sure your fingers don’t touch. Sellers are a lot less surly but some of them may be quite country and mumbly and difficult to understand. Paw through the items and hand what you want to the seller. She will then weigh it and tell you the price. Or just order a kilogram and let her do the picking and sorting. Many sellers have digital scales which makes buying just a handful of fruit/vegetables a lot easier. This results in prices often ending with the need for someone to exchange coins and so if you have the ability to pay in coins, the seller is much happier. Usually the bag comes for “free”. Once again, always lay your money down on the produce and not in the person’s hand. Generally speaking, however money changes hands, try not to touch their hand directly with your own. I don’t really eat meat but I can tell you the set up is that Romanians generally eat a lot of chicken and pork so you’re going to find lots of this. Beef is to be had but at a high price and maybe not the cut you were looking for. A good piata will have live fish but usually you can get pretty fresh fish of a few types. More exotic seafood is usually frozen only (esp from bigger retail stores). Well you can get a fresh liter of milk (lapte) at a good price but for everything else, you need to know your dairy on sight or else know the Romanian translations for what you want. Especially the cheeses. If you like cheese in the slightest, you will really like a lot of cheeses in Romania as they are made fresh and have an amazing taste. I really don’t know the translations in English for most of them but the good news is often the cheese vendors will let you try a slice for free before choosing. Take advantage of this! Exit piata with loaded sack of delicious goodies for not much money! There you go, you did it (big smile). You survived the Romanian piata! Previous Post Happy Birthday, Noodles! Pingback: Word of the Day: Iobag « I'm More Romanian Than You! Urda is the equivalent of ricotta in Italian, only that it’s harder, while ricotta is creamier. Pingback: What’s The Difference Between Me And You? « I'm More Romanian Than You! Pingback: The Cult of the Bottle Shakers « I'm More Romanian Than You!